Platinum double halo ring with pavé diamond setting by De Beers. Oval diamond ring in 14k white gold by Vera Wang Love. Princess cut solitaire with two rows of pavé diamonds set in platinum by Tiffany & Co.
Emerald cut diamond with an octagon double halo by Sylvie Collection. 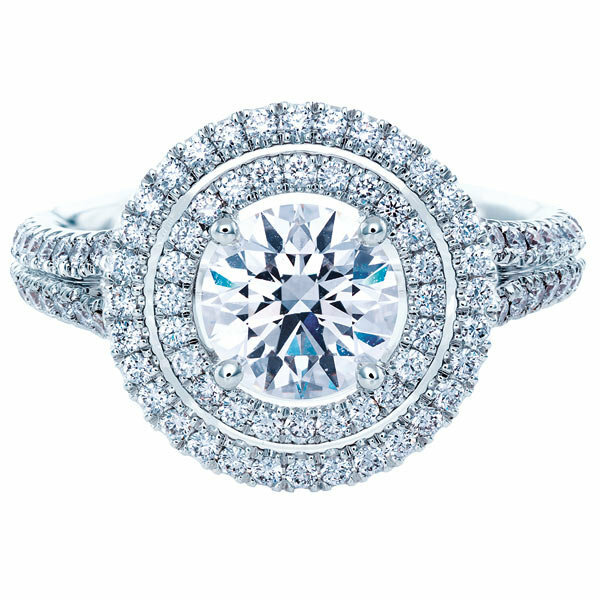 Princess cut double halo diamond ring in platinum by Monique Lhuillier for Blue Nile. Forevermark by Galili & Co.
Spiral double halo ring set in 18k white gold by Forevermark by Galili & Co.
Emerald cut solitaire with two rows of pavé diamonds set in white gold by Carizza.